I’m very, very jazzed about this book, if you can’t tell. The main plot of The Queen’s Secret was originally the main plot of The Rose Legacy. But there was already so. much. drama. happening in that first book that I decided to take this bit of peril out and make it the second book! And, as anyone who has listened to me talk about these books knows, I’ve wanted to write about a girl and her horse since I was a wee horse obsessed Jessy-pooh, and I’ve been working on these books, proper for about eight years! So come and see me on my tour! I’ll also be teaching a class on fairy tales at Writing and Illustrating For Young Readers! 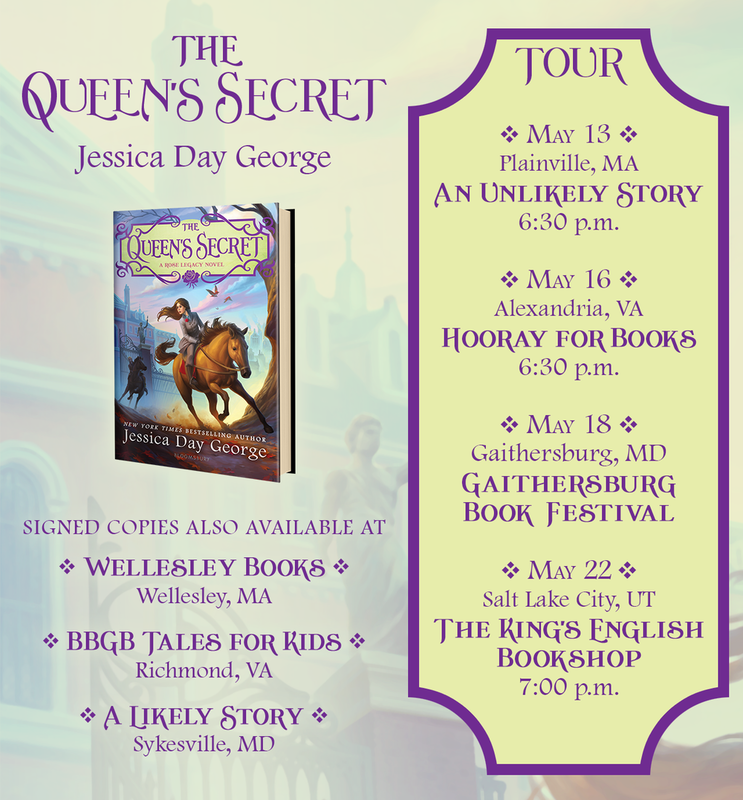 And tonight, this VERY NIGHT, April 15th, I’ll be at The King’s English talking with Fran Wilde and Dan Wells! And tomorrow I leave for Texas and TXLA! Let us every one hope and pray for an amazing and prosperous New Year! I know that I almost never blog anymore, and I’m sorry. I’m usually well behind deadline, and also . . . does anyone READ blogs anymore? But I thought I might as well blog this month, as I hate breaking with tradition, and you know what happens in January! That’s right, dear readers, it’s time for the Best Movies of 2018 list! Now, as those of you who have been reading Ye Blogge since the dawn of Ye Internette Age know, usually my Best of lists started with movies and then moved on to books. BUT. As many of you also know, I now do a newsletter called Jessica Recommends! And Jessica Recommends is where you will find the Best of the Books lists! That newsletter will go out on January 9th (this very Wednesday, that is to say), and will contain all my favorite books of the year. For those of you who don’t know about the newsletter, it’s easy to sign up, it’s free, and this year my only resolution is to make it a monthly newsletter, instead of a sort of every other month newsletter. Exciting, yes? YES. -The Queen’s Secret, my next book (sequel to The Rose Legacy) will be out in May. -I will go on tour for the book in May, dates/places not yet confirmed. -I will be updating the Events page shortly with some things like Life, the Universe, and Everything and the Gaithersburg Book Festival that are confirmed. And for now, the movies! My family watches a LOT of movies. We are, in fact, far more likely to turn on a movie in the evening than any TV show. That said, we truly enjoy the new DuckTales and the Great British Baking Show. This year I also discovered the joys of Jane the Virgin, sobbed my way through the saddest season of The Last Kingdom yet, rewatched all of The Expanse in order to stay caught up, and have just discovered Superstore, which has me CRYING with laughter! And now, for real, the movies! The Rose Legacy BOOK TWO! Girls and boys, readers of all ages! Please allow me to introduce my next book baby! For those of you who have wondered, who have asked, Is there a sequel to The Rose Legacy? The answer is (and always has been!) a resounding YES! The story of Anthea and Florian and all their horse and human (and owl) friends has always been intended as a trilogy, and I just finished the copyedits for book two! We also just decided on a title for book two . . . I am pretty sure my autobiography will be called, “Book Titles Are Hard to Write!” But my editor suggested this one and I loooooove it! I also love the cover art, once again by the amazing Kevin Keele! The book will be out in May of 2019, and more details will be forthcoming. But you can preorder it from Amazon, and add it to your Goodreads to-read shelf! Would you . . . like to see the title and cover art? The title is THE QUEEN’S SECRET! And the cover art is . . .